My name is Kate Davis and I'm a sophomore at The Spence School. When I was three and a half years old, I was diagnosed with Acute Lymphoblastic Leukemia. After a very troubling visit to my pediatrician, my family quickly submitted me to Memorial Sloan Kettering Cancer Center. Within a few days, I started treatment. Countless rounds of chemotherapy, surgeries and steroids kept me only ever at home or the hospital. I couldn’t go to school, and seeing a friend or adult outside of my immediate family was a rare and special occasion. Eventually, I became very weak and lost the ability to walk. This was when Sloan turned into more of a home for me. I spent many days with my roommate, Stella. When Stella didn’t make it, my parents told me that she had moved away so that I wouldn’t fear the same for me. Cancer became so frustrating. I didn’t understand why the medicines I took only seemed to make me sicker or why I had to go through what I was at all. My mom made a Things Kate Will Do After Cancer list. Going to school, playing at a playground, breaking my neutropenic diet, visiting my grandparents in Hawaii, and traveling to Disney World were a few things on the list. I’m so thankful today to be able to say that I’ve gotten to do everything on my list, and have been cancer free for over ten years now. Sloan Kettering has done so much to improve outcomes for kids like me, but there is still a lot to be done. 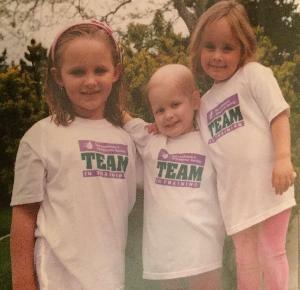 I walk with Kids Walk because I want to do all that I can to fight for a future in which children don’t lose the battle to cancer. For a future where the only possible treatment to cure a child isn’t toxic enough to kill them. For a future where more children will live long enough to complete their own special lists. Kids Walk For Kids With Cancer means the world to me because it provides a platform to work towards such meaningful change. 100% of the funds raised go to the Department of Pediatrics at Sloan Kettering, which treats more kids with cancer than any other hospital in the U.S. Only 4% of the National Cancer Institute's budget goes towards pediatric cancer research, and that's why Sloan's work is so important. The money you donate will go directly towards finding cures and better treatment options for children around the world.